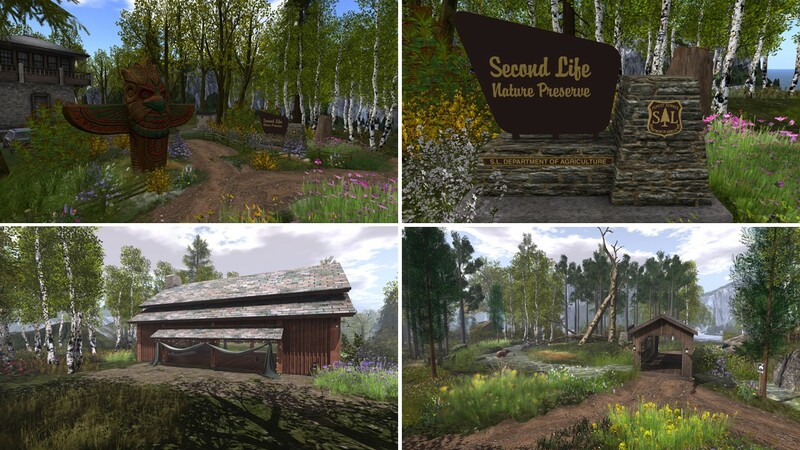 Sunday, March 24th, I visited “Secondlife National Park and Wildlife Refuge” (lateron shorter referred to as SL National Park) after reading Inara Pey’s blogpost “Touring Toshi Farms in Second Life“. 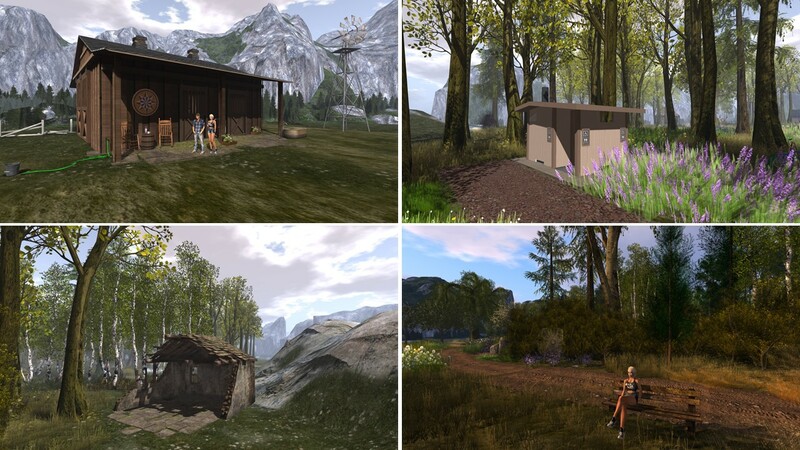 SL National Park is created and ownd by Syx Toshi and her partner Bryn Toshi (bryn bulloch). It expands over 2 (moderate) homesteads and it is changing according to the season or to it’s owner’s desire. “Come visit our Farm and Wildlife preserve. Its now spring at the farm and the forest is full of life. We have swiming, boating and nature trails. The area is also pet friendly“. The landing point of SL National Park is in the center of the Southern sim which is connected to the Northern sim by a bridge. Close to the landing point is a covered Bridge, an event barn and a private area that looks like being the park administration. It’s no surprise that you find yourself in a beautiful nature refuge. You can walk along the trails that will lead through the park. Along the trails are benches to take a rest and to admire the environment. But there’s more to do and to discover at SL National Park. For example you can rezz a canoe and see the park from the water getting a different view on it. The park is not restricted to the sim you land. It continues when you you walk over the bridge to the Northern sim, just the sim name changes to “Peace”. And walking further north you get to a Toshi farms. The main building of the farm looked quite private to me, hence I didn’t walk it. Not far from the farm, on the Eastern shore of “Peace” is a public hut, that offers space to sit at a fireplace or to sit on a balcony overlooking the sea and enjoying the peace of SL National Park. SL National Park is a great place to take pictures, to experience the almost unlimited possibilities of Second Life. It looks really natural and like a National Park in the US. It conjured a smile on my face when I discovered the toilets along the trails – just like you’d expect it when visiting a National Park. Along the way is a lot to discover, there’re are over 50 different animals living at SL National Park. Anything else I did beside taking pictures and enjoying the wonderful nature? Yes, I jumped and dived from the swimming platform close to the coanoeing. 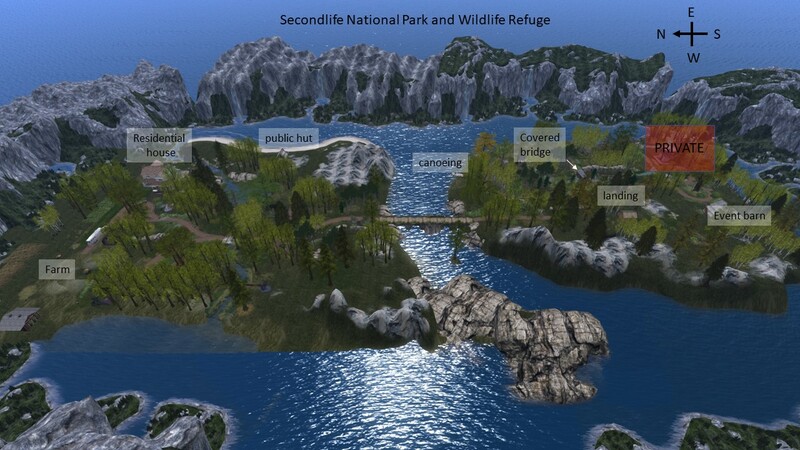 Thank you, Syx Toshi and Bryn Toshi (bryn bulloch) for sharing SL National Park with the public. I really enjoyed my visit.